Discover a whole new way to watch TV, play video games and more with the Apple TV. This incredible device instantly streams content from some of the most popular services like Netflix, Hulu and even HBO NOW, as well as iTunes and WatchESPN. The Apple TV with 1080p HD connects you instantly with the App Store where you can purchase thousands of games, fitness apps, educational content and more. The system is designed for easy use with an interactive Siri Remote that works just like Siri on your iPhone. Simply ask Siri to pull up a streaming service or an app and within seconds, you're ready to watch whatever you want. The Siri Remote features a virtual directional pad as well as manual controls. 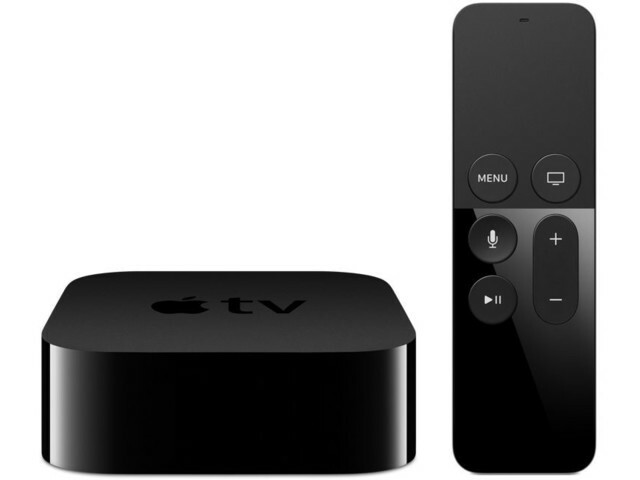 The Apple TV with remote delivers 1080p HD with Dolby Digital 7.1 sound for truly immersive viewing. The system is compatible with high-definition TVs with HDMI, for added convenience.